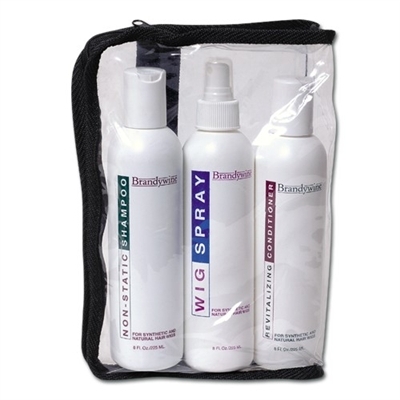 Brandywine Wig Maintenance Kit | Hair Care Products We Price Match! Brandywine is made to maintain the beauty of synthetic and human hair wigs & hairpieces. Brandywine Non-Static Shampoo is an excellent non static shampoo that leaves hair glossy clean. Cleans, conditions, and removes hair spray from wigs and hairpieces. Brandywine Revitalizing Conditioner will bring life back to dull hair and leaving it softer, shinier, and easy to manage. Brandywine Wig Spray is water soluble, crystal clear, and quick drying. It holds your style without making your hair sticky or gummy. This amazing wig spray holds styles firmly & beautifully while leaving the hair easy to manage and comb. SHAMPOO DIRECTIONS: Before shampooing, gently comb out excess product, snarls, etc. with a wide tooth comb. Pour a small amount (approx. 1-2 capfuls) of shampoo into a sink or basin of cool water. Immerse hair in mixture and let soak for 5-10 minutes. Right before you remove the hair, gently swish it around. Remove hair from basin. Fill basin with clean water and swish hair until shampoo is removed. Follow with Brandywine Revitalizing Conditioner. DO NOT WRING, TWIST, COMB, OR BRUSH HAIR WHEN WET. RECOMMENDATION: With hand-knotted and human hair products we suggest that you DO NOT swish the wig/hairpiece in the basin. Our stylists recommend holding the wig/hairpiece over the basin and use a cup to pour the water over it so it flows in the same direction as the hair. This procedure will ensure that the hair does not change direction and tangle. All other directions still apply. CONDITIONER DIRECTIONS: After shampooing, pour a small amount (approx 1-2 cap fulls) of conditioner into a sink or basin of cool water. Immerse hair and gently work mixture through the hair. Remove hair from mixture and rinse thoroughly in clear cool water. Blot hair with dry towel to remove excess water. DO NOT WRING, TWIST, COMB, OR BRUSH HAIR WHEN WET. Hang to air dry and style when hair is completely dry. WIG SPRAY DIRECTIONS: Hold dispenser 10-12 inches from hair. Pump atomizer with quick, short strokes. I was a little hesitant to wash my hair piece. But I followed the directions and it worked out great. These are very nice products. Thank you.